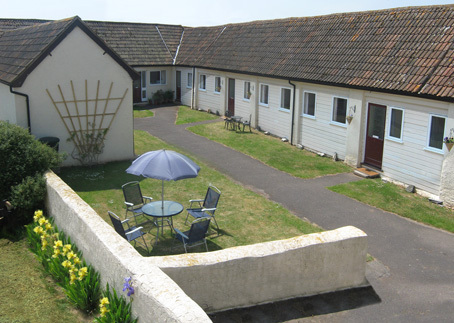 Six comfortable individual Self Catering Holiday Bungalows are available, arranged around a central courtyard. The bungalows were converted from stables in the 1970s and linked to the main farmhouse by an archway. A flat is available within the farm house but accessible via its own front door. The walls of the farmhouse are thick stone and therefore the flat is quiet and private. All lettings have flat screen televisions with Freeview and DVD player, toaster, microwave, oven with grill, refrigerator, kettle, cutlery & crockery. All bed linen is provided. There are freezer compartments in some bungalows. 1 Norman's Nest 2 bedrooms. Sleeps 4, with room for additional bed making 5 places. 2 Winifred's Warren 2 bedrooms. Sleeps 5, with 2 additional places on a sofa bed if required. 3 Frank's Folly 2 bedrooms. Sleeps 3. 4 Ruby's Retreat 2 bedrooms. Sleeps 4. 5 Ronald's Rooms 2 bedrooms. Sleeps 4. 6 Dorothy's Den 1 bedroom. Sleeps 2. Flat 1 bedroom. Sleeps 2. Sheets, pillow cases and duvets with covers are provided and can be replaced weekly if requested. Washing machines, tumble driers, irons, ironing boards and vacuum cleaners are available. There is a small charge for use of the washing machines and tumble driers. Please also supply your own washing powder, conditioner etc. Each bungalow has a smoke detector, fire extinguisher and fire blanket. Additionally, in the courtyard is an emergency bell to alert others in the event of an emergency. We regret that bath towels cannot be provided. Customers are advised to bring their own. There is an ample car parking area at Court Farm. Vehicle access to the inner bungalow courtyard is permitted for loading and unloading. The electricity for each bungalow is by £1 coin operated meter. Accommodation may only be occupied by the persons stated on the booking form. Just pay for the first night when booking as a deposit to confirm the booking (Deposits are non-refundable). The balance of your holiday is to be paid no later than 30 days before commencement of the holiday. In the event of unforeseen circumstances causing cancellation of the holiday, please notify us without delay, because at 30 days before commencement of the holiday and thereafter the full rental is non-returnable. The Management takes all reasonable precautions but cannot be held responsible for accidents to persons or loss or damage to property. Any breakages or damage caused during your stay must be reported and a charge could be applicable. If you will be arriving after 6.00pm please advise accordingly. Bungalows may be occupied from 2.00pm on day of arrival and must be vacated by 10.00am on day of departure. Prices from £45 per night. Please telephone or email for details. A deposit of the first nights stay is required to confirm the booking (Deposits are non-refundable). Please telephone or email your booking as soon as possible to be sure to get the nights that you want. Children should not be allowed to play unsupervised in the grounds. We accept no responsibility for any injuries etc. Smoking, vaping and e-cigarettes are not permitted in the bungalows or the grounds of Court Farm.